(From the Palestine Telegraph) To be a Palestinian in this world today is a truly unique experience. You are made to and in fact, begin to feel that you are “different” from everyone else the minute that you start to understand and comprehend what your birthright means for you. By the simple fact of being born on and living on that small piece of real estate between the Jordan River and the Mediterranean Sea , your life takes you on a path that others cannot fully comprehend. Simple arrival in this world is looked at with suspicion and no small amount of concern. You are not just another baby: you are a statistic to be counted and watched by those who worry not about your welfare or your future, but about the fact that another Palestinian has been added to the ‘demographic equation’. Those that watch the demographics with concern would be happier if you were never born at all, and if in you had to come into “their world”, it would better elsewhere. Your arrival adds to their worry that they would lose the majority. A majority based on the “exclusivity” of a “chosen” race and religion, even though you can trace your ancestors to that piece of land for thousands of years, in the eyes of the demographers, you are not welcome there. From the very first day that you could understand your surroundings, you begin to comprehend the burden of being a Palestinian. While other children in the world learn and play in an atmosphere of relative safety and bliss, you cannot. Your life is regulated by the ever present occupiers: settlers and their soldiers. While other kids retain the innocence that goes with childhood, yours is shattered and traumatized by the sights and sounds of the endless war of attrition surrounding you. Things that would make adults cringe with horror in other parts of the world are a part of your everyday life and in fact, become “routine”. You become as hard as your surroundings. The games of childhood are no longer innocent and lose meaning or interest to you. The games that you play reflect the desperation of your Palestinian reality. While others plan and look forward to a future, you are concerned only with surviving the present. Your father, once the pillar of your life, the man who made you feel safe and secure, can no longer find work to support your family. He is stripped of his clothes and his honor, right there, in full view of the world: you begin to see that he cannot be the guarantor of your well being. Your heart aches to see him in such light. In your youthful anger, you want him to lash out and defy, resuming his proper place in your eyes. Yet the reality is that he cannot, and you begin to understand that it is not out of fear for his own safety, but from his fear for the well being of yourself and siblings. You begin to understand the great burden that he must shoulder in silence, suffering alone. Your mother, the symbol of all that is good and pure in this world, is reduced to begging and pleading just to be able to move from one area to the next. You watch in horror and rage as a young Israeli soldier yells profanities and makes derogatory remarks to her. 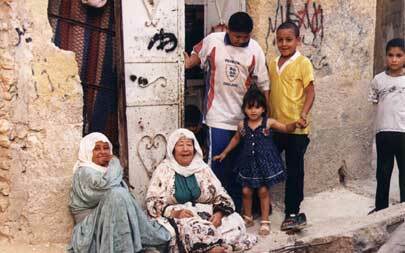 Yet she holds her ground and with the patience that only a Palestinian mother can have, she perseveres. She has been pushed to the forefront of trying to provide for and keep her family going. She undergoes the greatest humiliations at the checkpoints in order to spare your father worse treatment. She steps between you and danger, following her motherly instincts, shielding you from certain harm. You wonder what she thinks about during those sleepless nights, but you will never know, for she bears this burden in total silence. You go to school, when allowed, and get good grades, yet you know deep down in your heart that no matter how much education you have, the best that you can hope for is a low paying menial job, even at that, a scarcity. You see the young men gather everyday on the same streets, in a ritual of boredom and futility. They either have finished their schooling or just quit out of frustration and hopelessness. Their numbers seem to grow daily, as their prospects for a hopeful future diminish. This, you begin to understand is the byproduct of the many decades of occupation, colonialism, and brazen policies to keep your people down, desperate, and broken. You begin to feel your loneliness in this world, to understand that the rest of the world doesn’t know of your plight or simply doesn’t care. You watch television images of your tormentors, living but a few kilometers away, enjoying the very life that they deny you. Your life, home, land, and history continue to be stolen, destroyed, and expropriated by others in an endless campaign to erase “Palestinian” from the land whose very soil, is mixed with the blood, sweat, and tears of your ancestors, and no amount effort will ever “cleanse” the land of the traces of its rightful owners! While the world at large, including those that count themselves as your “brothers” in the Arab world, make yet another proclamation, statement, and preach about freedom and justice, they collude with your tormentors to imprison, starve, and oppress you in everyway possible: setting aside the very Conventions, laws, and acts of human decency that they espouse, as if those things are meant to apply to everyone, BUT those that happen to born Palestinian! You watch with envy and anger as others enjoy the freedoms forbidden to you. While others travel around the world and claim that indeed the world is a “smaller place”, you scoff at them because you cannot even travel a few kilometers to visit family, loved ones, in your own homeland. Your world grows “smaller” and more claustrophobic each day, filled only with suffocating blockades, check points, closures, and curfews. The last parliamentary elections of the Zionist entity proved beyond doubt that there is no right or left as well as there are no extremist Zionists and no moderate Zionists, they are equally extremist in their hatred of Arabs, and their aim to fulfill their final goal that is to complete their ethnic cleansing of every single Palestinian Arab still sticking to their land from their historical homeland, Arab Palestine. Zionists consider the indigenous Arab population as an enemy within the entity; so being as such it is either our death or uprooting. The result is the same… It is either me or you!!! 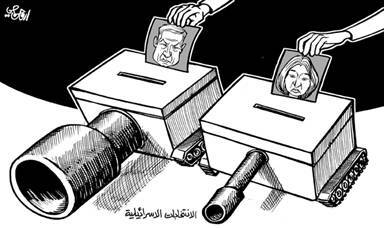 For the first time in twenty years the veil dropped off the face of the Zionist candidates and their parties’ programs by dropping the deceiving and unwanted peace from their electoral programs, of course with the Arabs. In the past they always claimed that Palestinian Arabs are the obstacle to peace, and they are, Zionists, who call for it. quoting Elias Khoury, a 33-year-old architect from the village of Ibilin in Galilee, who had been a lifelong supporter of the Communist Democratic Front, the only joint Arab-Jewish party represented in the Israeli parliament. No longer. Tomorrow, when Israelis head to the polls to elect their next government, Mr. Khoury – one of the country’s 1.2 million Arab citizens – will be staying home rather than casting a vote. Khoury said, “I’ve given up on the talk of coexistence,” and added. “Now it’s clear it is just empty rhetoric. After the attack on Gaza, I am sure there will never be two states here. It’s going to be either a Jewish state with no Arabs, or an Arab state with no Jews. Voting any Arab party into the parliament is a waste of time.” Of course this is a reflection of the over 90% or actually more of the Zionist electorate that endorsed the Zionist war waged last December/January, as well as being anti coexistence with Palestinian Arabs as well as in other occupied Arab territories. The Zionist imported society on all levels, of interests and professions had been cooking for their hatemongering and as thus warmongering against Arabs at large and Palestinians in particular, the vast majority of their university professors, historians and “philosophers” such as Benny Morris of Ben Gurion University in the Negev and Martin van Creveld, a former professor of military history at the Hebrew University in Jerusalem and a world-leading writer on military matters, who both, like all their other colleagues, claim to be speaking on behalf of the civilized white European world, which has the right to annihilate third world peoples to establish their new civilized democracies on their lands, of course with no exception Zionist military personnel are the teachers for and revivalists of Zionist hatred and warmongering.